This **[Everyday Green Smoothie](http://www.breakfastfordinner.net/everyday-green-smoothie/)** is made with easy, every day ingredients. From **Breakfast for Dinner**. If you want to use a spoon instead of a straw, try this vegan **[Green Smoothie Bowl](http://www.radiantrachels.com/green-smoothie-bowl/)**. From **Radiant Rachels**. Green smoothies don't have to be spinach or greens based. Why not try this **[Kiwi, Pea and Almond Green Smoothie](http://www.cookingsutra.com/kiwi-peas-almond-smoothie-df-option/)**. From **Cooking Sutra**. Add some zing to your morning with a touch of ginger in this **[Apple Ginger Green Smoothie](http://climbeatcyclerepeat.com/sunday-smoothie-week-3/)**. From Climb Eat Cycle Repeat. The refreshing hit of mint will make this **[Get Your Greens Mint Smoothie Bowl](http://www.pureandsimplenourishment.com/blog/2016/11/get-your-greens-mint-smoothie-bowl.html)** a morning favourite. From **Pure & Simple Nourishment**. Get your morning greens on with this **[Green Smoothie](https://alushlife.ca/home/a-sugar-detox-and-a-green-smoothie/26/1/2017)**. From **A Lush Life**. When your smoothie is called "**[Great Day Smoothie](https://fuelgoodness.com/2017/02/23/great-day-smoothie/)**", you know your day is going to get off to an awesome start! From **Fuel Goodness**. 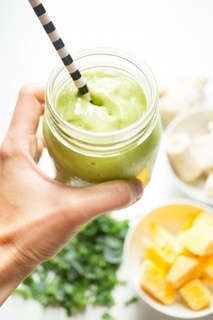 This naturally sweet **[Mango Spinach Green Smoothie](http://www.savourandshine.com/mango-spinach-green-smoothie/)** is a great way to start your day! From **Savour and Shine**. If you'd rather eat your greens than slurp them, try our **[Eat Your Greens Smoothie Bowl](https://www.foodbloggersofcanada.com/2017/01/the-7-day-smoothie-bowl-challenge-day-1-eat-your-greens/)**! Because sometimes you want something thicker and creamy and colder than a smoothie. With Chocolate. So a bonus **[Vegan Shamrock Shake](http://www.insightfulbite.com/vegan-shamrock-shake/)**. From **Insightful Bite**. A big thank you to all our FBC Members who participated in this week's green smoothie roundup!